poor Link he looks a little green, i hope he doesn't throw up and i wonder how he's gonna get out of this one! Murphy's law anything that can go wrong will go wrong. 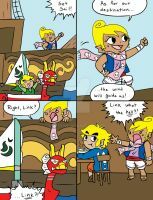 Good one, Navi. Nah, annoying or not, I like her. 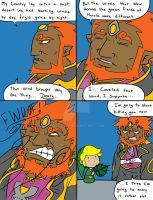 I forget, could you feed them bomb flowers in OoT? 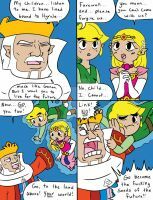 XD I personally missed Navi at the end of the game. I wonder if this Link will also. I mean that I wonder if the Link in girldirtbiker's comic will miss Navi when she leaves (if she leaves). ... Okay, either you didn't watch after the credits or there's another version of the game that I don't know about. EITHER WAY, FORGET IT; I SAID NOTHING; CHILL. 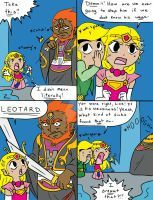 Just enjoy this comic for itself because it's not exact anyway. YOU ALSO FAILED TO WARN THEM. WHAT HAPPENED TO "WATCH OUT!"? whos the wolf? is it the hero of twilight? If you stumble into a story mid-way, there are bound to be elements that might confuse. 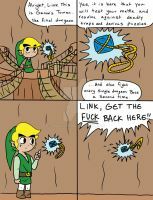 Don't worry Link, I go through motion sickness too. yet again, navi proves how problems are just a few words away. 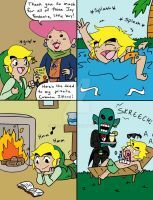 I love Link in the first panel. I can't wait to see how he gets around this one.